A couple of blocks upstream from yesterday's 'D' Street Bridge is the Balshaw Pedestrian Bridge, a 120 ft long timber bowstring truss that was built in 1989. The bridge was constructed in a yard in Santa Rosa, carried by barge, and assembled across the Petaluma River in downtown Petaluma. Like many urban bridges, this one was named after a city councilman. 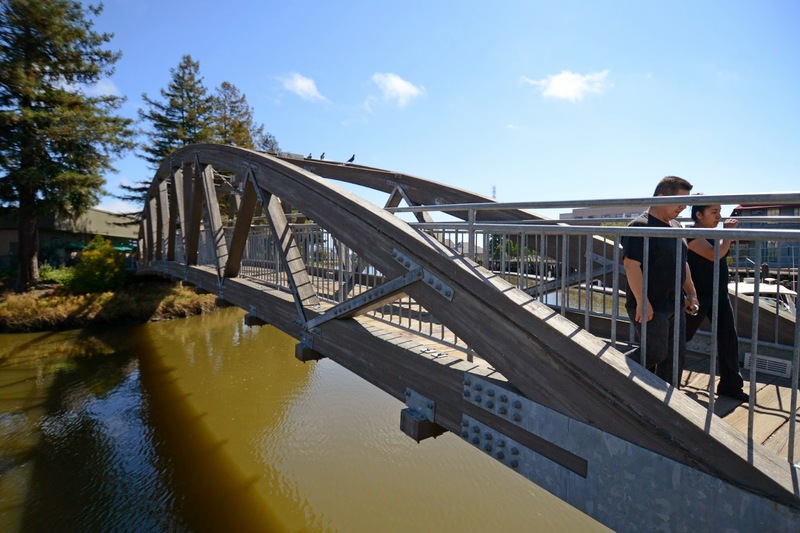 Timber truss bridges (like the previously studied Rancho Murieta Bridge) can be nice, but the top chord is splitting on this bridge and no thought was put into creating an attractive handrail. This rail dominates and makes the bridge look like it's being supported by the steel railing. Sonoma County, California Bridges: Balshaw Bridge across the Petaluma River by Mark Yashinsky is licensed under a Creative Commons Attribution-NonCommercial-NoDerivatives 4.0 International License.